There are almost 30 million small businesses (SMBs) in the US today, accounting for 99.7% of all businesses. According to the applicants we surveyed, 74% are sole proprietors, or self-employed. So why are so many of them running their daily business completely uninsured? We know the answer, as we struggled to get insurance for our last business: availability. Before we founded Next Insurance, we tried to purchase the right insurance policy for our last company – and just couldn’t find what we needed online. We knew there had to be an easier way for small businesses to get the comprehensive, affordable coverage they needed, and we started Next to enable small businesses to quickly obtain tailored, affordable insurance policies entirely online. 44% is a staggering number of businesses who have been operating for at least a year to have never had insurance, but we aren’t surprised. The current insurance landscape doesn’t exactly offer policies that are accessible, tailored for different classes of business or easy to maintain or cancel. Insurance agents still dominate the process, acting as the middleman between insurers and their customers and often selling insurance policies that are wholly irrelevant to their client’s nuanced needs. They are also generally overpriced and can contain exclusions that render the policies they are selling effectively useless. And then there is the issue of availability and accessibility – purchasing insurance offline is a notoriously long process and business owners are looking to move quickly. An astounding 74% of applicants surveyed wanted their insurance coverage to start within a week, and 49% of those wanted their insurance the same day. Offline legacy insurance providers simply cannot accommodate this demand, with underwriting being done manually and often with no data analysis involved in the process at all. In today’s fast paced, digital-first world, insurance solutions should be quick, easy to access, tailored to fit the needs of consumers and reasonably priced. 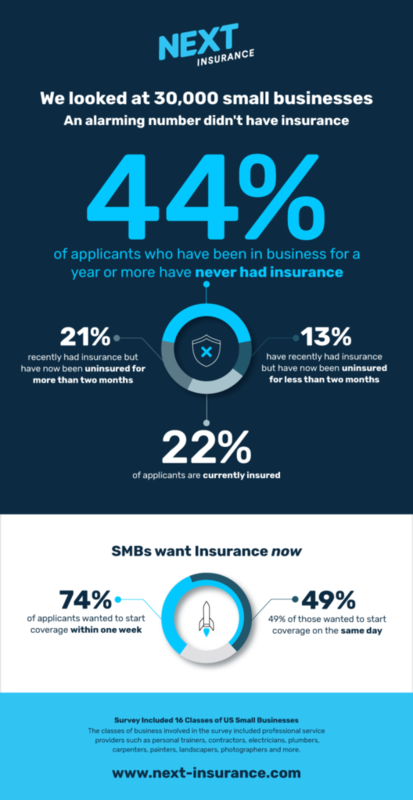 These findings highlight a confidence vacuum within the SMB insurance industry, and also raise concerns for consumers employing small businesses that might be uninsured. Insurance provides a safety net for both sides of a transaction should an accident/contract infringement occur, and by removing insurance from the equation – consumers and small business owners are vulnerable. Not only can consumers be stuck with damage to cover out of pocket, but the valuable trust between businesses and their customers begins to erode when the processes designed to aid in these scenarios are not in place. The entire approach to insuring small businesses needs to change. First, we need to get personal with businesses and understand their needs. The insurance needs of a plumber are vastly different from those of a personal trainer, and insurance companies can learn a lot from talking to people on the ground. That’s how we designed our policies, treating each business individually. In the coming months, we expect to provide policies to hundreds of different classes of business, with each policy specifically tailored to the business requirements of that specific industry. Second, the insurance process should be completely digital. The overwhelming preference of today’s consumers – from shopping to finance – is for online access, and insurance is no different. That is why we have digitized the entire insurance process, making our sign-up process as smooth as possible with our online registration. We also aim to make the insurance purchasing process a speedy one. In fact, half of the small businesses signing up with Next Insurance have a policy in hand the same day they apply! We then carry the “ease of use” principle through to managing and cancelling a policy – both are quick and convenient through our online portal. By moving the insurance process online and customizing policies, as well as implementing machine learning and other technologies to improve efficiency and accuracy, we are creating an insurance landscape that ensures that all businesses have the confidence they need to thrive.